Flank Steak with Jazzy Pinto Beans Taco Bowl is a fun way to serve a taco salad by making your own taco bowls out of flour tortillas. I have provided instructions for a zesty and spicy marinade for the flank steak that is full of Southwest flavors. I will also show you how you can jazz up a can of pinto beans to make people think you cooked them from scratch. This delicious Southwestern-style Flank Steak with Jazzy Pinto Beans Taco Bowl recipe, comments, and photos were shared with me by Karen Calanchini, Food Stylist and Photographer, of Redding, CA. Check out my recipes for salsa and guacamole dips! Prepare Marinated Flank Steak either the night before or at least 8 to 10 hours before ready to use. Prepare Jazzy Pinto Beans the night before or at least 30 minutes before ready to prepare the Taco Bowl. Have all your ingredients measured and ready to go - Mise en Place. Place flour tortillas into Tortilla Bowl Makers or oven-safe bowls (that will hold the tortillas), sprayed with non-stick spray. Lightly spray the exposed side of the flour tortilla. Bake in preheated 325 degrees F. oven for 10 minutes or until the tortilla starts to puff and turn golden. Remove from oven, let cool slightly, and place on individual serving plates. Layer taco bowls with lettuce, warmed Jazzy Pinto Beans, Marinated Flank steak slices, red onion, avocado, cherry tomatoes, olives, green onions, cilantro leaves, and Cotija cheese. Serve with sour cream and salsa or taco sauce on the side. This wonderful marinated flank steak is perfect for making taco bowls, tacos, burritos, or just served thinly sliced. Leftovers are also great in sandwiches. In a medium-size bowl, combine all the above ingredients; whisking to blend. Place flank steak in a 9-x 12-inch dish or a large zip-lock plastic bag; cover with the prepared marinade. Cover, refrigerate, and let marinate overnight or at least 8 to 10 hours, turning several times. 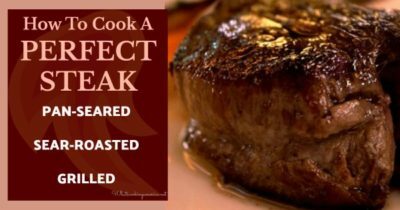 When ready to cook, remove from refrigerator 30 minutes prior to grilling. Prepare and preheat your grill for cooking. Grill the marinated steak 5 to 7 minutes per side, iis medium rare or until the internal temperature reaches desired temperature on your meat thermometer (see below). NOTE: This steak is best cooked rare to medium rare. If overcooked, the meat can by dry and chewy. Remove from heat and let steak rest 5 minutes before slicing. With a sharp knife, slice steak thinly against (diagonal) the grain. * I purchased and used organic pinto beans. You may use any type of chile peppers available to you or that you have in your garden. Red and green bell peppers may also be used if you like less heat. My peppers were very small, so adjust the amount you use depending on the size of your peppers and how spicy hot you want the beans to be. ** If you have the time, dried pinto beans may also be used. Prepare them as directed on the package and proceed with this recipe. Dried beans have a firmer texture and taste entirely different than canned beans. Reduce heat to low. Add pinto beans, cumin, and salt (if necessary), stirring well. Let simmer for approximately 30 minutes. NOTE: Watch beans carefully so they do not stick to the pan. Add a little chicken broth, if necessary. May be prepared the day before, stored in the refrigerator, and warmed up before serving.